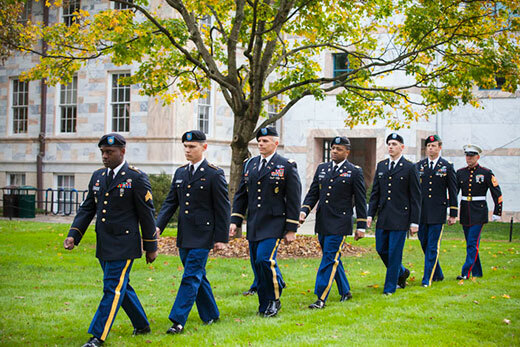 All faculty, staff, students and alumni are invited to Emory’s annual Veterans Day commemoration on Wednesday, Nov. 8, at 11 a.m. on the Emory Quadrangle. Veterans Day at Emory is sponsored by the Employee Council, Emory Veterans Association and the Office of the President. There will be a flag ceremony with Emory veterans and ROTC cadets and remarks by Emory President Claire Sterk. The guest speaker this year is Michael Heekin, who served as a captain in the U.S. Army and as former chief operations officer of WedMD. Jeff Rosensweig, Goizueta Business School associate professor of finance, will be the master of ceremonies, first introducing Sterk, who will speak about Emory's initiatives to serve and support veterans. Rosensweig is the founding faculty sponsor for the Emory Veterans Association. Following Sterk’s remarks, attendees will observe a moment of silence to commemorate the original Armistice Day’s ending of World War I hostilities at the 11th minute of the 11th hour of the 11th month. Heekins’s remarks follow the moment of silence. In addition to being a veteran, Heekin serves on the board of the Atlanta Veterans Affairs’ Research and Education Foundation. He has also been associate dean of the Florida State University College of Law. He received accounting and law degrees from the University of Florida and an MBA in finance and marketing from the Wharton School. After the ceremony, attendees are invited to enjoy refreshments provided courtesy of Tab Ansari, professor of pathology in the School of Medicine, who served as an officer in the Navy and is a Vietnam veteran. “This will be our ninth annual Emory Veterans Day Ceremony and it seems to grow larger each year,” says Andrew West, a key organizer, veteran and senior center administrator of the Georgia Clinical and Translational Science Alliance in the Emory School of Medicine. “The Veterans Day ceremony is incredibly important to me and to the Employee Council representatives,” notes Deena Keeler, Employee Council president. The proposal to honor veterans at Emory was initiated in 2008, supported by West, then-Employee Council President Matt Engelhardt and Emory Historian Gary Hauk, with the first ceremony held in 2009. West attributes the event's continued success to the many people who have championed it through the years, including former Emory President James Wagner, Sterk, Hauk, Engelhardt, Ansari, Rosensweig, the Emory Veterans Association and the Employee Council. "Most importantly, we are grateful to everyone who attends this event each year to show their support,” West says. One initiative concurrent with this year’s Veterans Day Celebration is an invitation to Emory alumni to become mentors for a day through Veterati, a digital mentoring platform that supports the careers of service members, veterans and military spouses who are transitioning into the civilian workforce. Co-founded by Emory alumnus Daniel Rau 13B, Veterati links these job seekers with successful professionals for free, one-hour mentoring phone calls. The Emory Alumni Association (EAA) and Veterati are partnering to provide alumni with the opportunity to support this community by using personal career and professional growth experiences to advise and accelerate the futures of those who served in the U.S. military. Several projects hosted by the EAA for the upcoming Emory Cares International Service Day, held this year on Saturday, Nov. 11, also focus on serving veterans. Contact the EAA for more information. Also of interest for Veterans Day, a new exhibit titled “A Question of Manhood: African Americans and World War I” will be on view through Jan. 8 in the Stuart A. Rose Manuscript, Archives and Rare Book Library, located on the tenth floor of Woodruff Library. In conjunction with this exhibit, a screening of the film “Men of Bronze: The Black American Heroes of World War I” will be Wednesday, Nov. 15, at 6:30 p.m. in the Jones Room of the Woodruff Library. For more information on Emory’s ongoing and extensive involvement with veterans, including investing in veterans as students and caring for veterans in the community, please see Veterans at Emory.